“The past year has been an exciting one for Shopee not only in the Philippines but also across the region. We have achieved many significant milestones, such as the most recent Shopee 11.11 Big Christmas Sale which broke 11 million orders regionally on November 11. 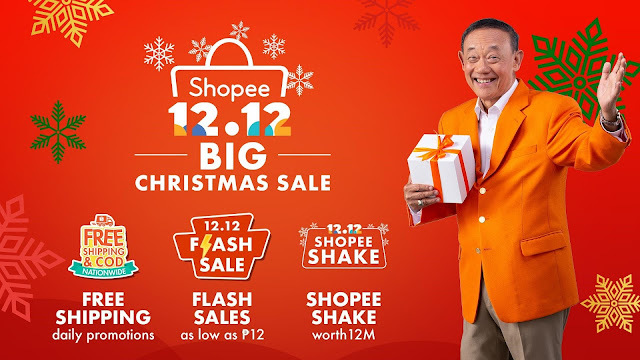 The Shopee 12.12 Big Christmas Sale marks the final leg of the year and we are excited to end it with a bang. We want to thank all our shoppers, sellers, and brands for their unending support on this journey, and will continue to push even more boundaries and drive e-commerce in the region forward,” said Terence Pang, Chief Operating Officer at Shopee. Starting November 26 to December 12, Shopee 12.12 Big Christmas Sale will feature over two weeks of daily promotions at up to 99% off. Leading brands including P&G, Maybelline, Vivo, SM Store, Silverworks, Unilever, Lactum, and Platinum Karaoke will also be joining in the Shopee’s 12.12 Big Christmas sale celebrations with exclusive deals for Shopee users this festive season. To add to the celebrations, Shopee will also be launching its brand new in-app game, Shopee Quiz, during Shopee 12.12 Big Christmas Sale. The interactive live quiz will require users to answer a series of questions in order to win from a prize pool of hundreds of thousands of Shopee Coins. Shopee Quiz sessions will be happening daily at 9 PM from December 4 to December 11, and at 12 noon and 9 PM on December 12. In addition, Shopee’s trademark in-app game, Shopee Shake, returns for one last run in 2018. Users should watch out for Shopee Shake sessions happening twice daily at 12 noon and 7PM throughout the campaign, and eight times on December 4, 11, and 12. In partnership with Wish 107.5, Shopee will be holding an exclusive bus tour with Shopee’s Christmas ambassador, Jose Mari Chan. On November 26, the Shopee Wish Bus Tour will make several stops around Metro Manila for live Christmas performances, games and giveaways. The different stops for the tour were determined by users who voted via the Shopee app, with Starmall EDSA, Shaw; Ayala Triangle, Makati; and Market! Market!, Taguig City emerging as the top three voted locations. On November 26, users can head down to the three locations to meet Jose Mari Chan live in person or tune in to the happenings of the Shopee Wish Bus Tour streamed live on Shopee’s Facebook page. As a treat to users this festive season, users who manage to spot and post a picture of the Shopee Wish Bus on Facebook or Instagram will also be in the running for a special Christmas giveaway. To qualify, users will need to tag and follow @shopeeph on Facebook and Instagram, and include the hashtags, #ShopeeWishBusTour, #ShopeeBigChristmasSale, and #ShopeePH1212. “The Shopee 12.12 Big Christmas Sale is a way for us to show our appreciation to all our loyal users in the Philippines. As the end of 2018 approaches, we invite all the Filipinos to join us in celebrating another key milestone in our Shopee journey.” Pang closed. For more information on the Shopee 12.12 Big Christmas Sale, visit http://shopee.ph/12-12 Download the Shopee app for free via the App Store or Google Play.